Home / Uncategories / "I believe that all women are pretty without makeup. And can be pretty powerful with the right makeup"
"I believe that all women are pretty without makeup. And can be pretty powerful with the right makeup"
Ok, so I know. This has been out for quite a while. And everyone has talked about it. But I had to put my two cents in. And in case you've been living under a rock and have no idea what this is, it's the Hourglass Ambient Lighting Blush Palette. I'm in love. When I first saw this palette, I thought the colours would be way too dark, and I thought they would be too shimmery. I have super oily skin, so I try and stick with all matte products as my base. But when I won the gift card for a shopping spree at Yorkdale, I figured, why the hell not pick it up. Worst case scenario, I could always return it. But when I tried it (the day after I bought it, obviously), I instantly knew it would be a new holy grail product. The middle colour, Incandescent Electra, is unique to this palette, and it's probably the one that I'm the least impressed with. Even thought I am incredibly pale, I find it too subtle to wear on its own. I either like to mix it with the far left, or add some of the Benefit Majorette Blush Booster underneath. It's a pale orangey-peachy colour. Like all of them, it has a very natural, luminous sheen that makes it easy to forgo a highlighter for the day. The left colour is gorgeous, and my favourite for a natural makeup day. Luminous Flush is a really natural pinkish-red colour (I'm so great at describing things, aren't I?). What I love about these colours are that you really can't go wrong with them. You don't need to be tentative or light handed because you really can't over do it. But it's definitely buildable, so you can make it as sheer or opaque as you want. And lastly is Mood exposure, on the right. I was so tentative to try this colour. I didn't think I would ever use it, let alone love it. It looks like a relatively ugly brownish colour that I didn't think would suit my pale complexion. But it has become my absolute favourite colour in the palette (potentially my favourite ever blush--gasp). It actually goes on my skin in this gorgeous pinky-purple shade, that goes absolutely flawlessly with my Naked 3 palette. It looks really natural, adding a bit of warmth and shimmer to my complexion. Overall, I can't recommend this palette enough. Although, I would caution if you are dark skinned, seeing as they are not overly pigmented (but if you want to keep layering it on, then by all means give it a go). It feels luxurious on the skin, comes in the sleekest packaging, and if anything else, looks gorgeous sitting on my desk/vanity. 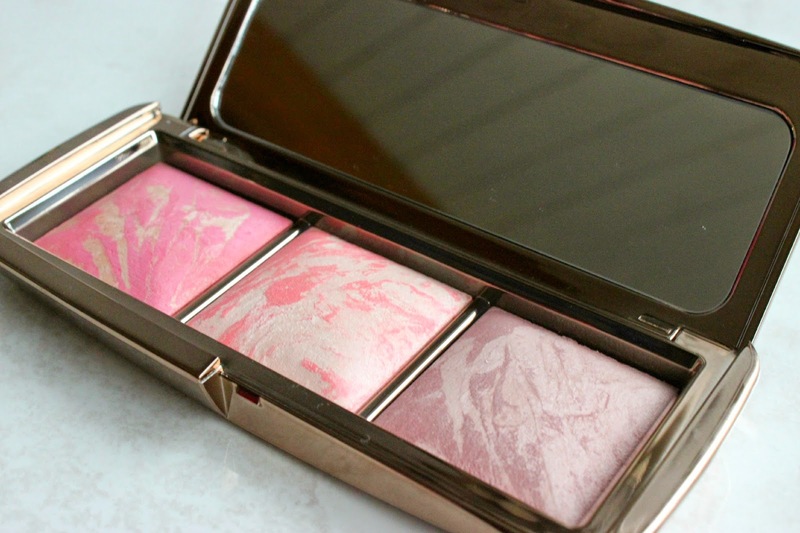 Have you tried the Hourglass Blushes? What are your thoughts?